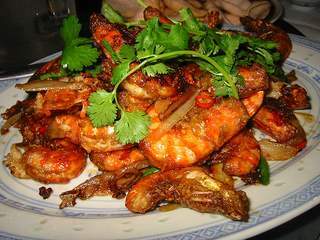 (Cold Spiced Prawns are a delightful, refreshing appetizer - the perfect way to start off any dinner party. The prawns should not be kept longer than 6 hours in refridgerator prior to preparation and serving). Heat oil over moderate heat for 1 minute. Add prawns and stir-fry for 2 minutes. Transfer to Platter. Add remaining oil, then spring onions and ginger. Stir-fry for 30 seconds. Add stock, tomato sauce, vinegar, sherry, sugar and cayenne pepper. Simmer and stir 3 minutes or until sauce has thickened. Return prawns to pan, cook stirring 3 minutes longer. Pour the mixture into a bowl; cover and refrigerate for 4 hours. Arrange lettuce leaves on platter, mound prawns on top. Chop reserved onion tops and sprinkle over.